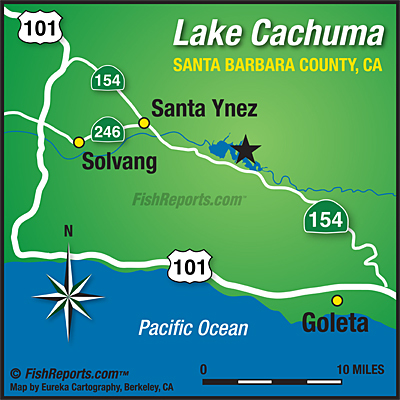 Lake Cachuma Marina and Tackle shop are now open from 6:30 am to 6:30 pm. The lake is 78% full. We just added more pontoon boats and fishing boats to out fleet. Arrive early on the weekends to get a pontoon boat. All boats are first come first serve. 2 pound tout was caught at Cachuma Bay on Green Powerbait. 9 pound tour caught trolling on needle fish. 36 bass were caught at the point on Robo worms. Trolling with spoons or rapalas is a good bet. Trout are being caught with nigh crawlers form the shore. Fish scattered to the east side of the lake.